Join us for five events in Austin, Texas that distinctly celebrate the contributions of women and nonbinary artists to music, film, comedy and creative industry. Individual event passes ($10 to $25) and three-day passes for all events ($50) are available here. Following our opening reception on August 30, Day One of BABES FEST begins with a film showcase, featuring 20+ women and nonbinary filmmakers in Texas. The evening's film shorts range from comedy to music to narrative to experimental and some of night's longer works will even be accompanied by live performances. Come hang. Tickets are only $10 and can be purchased individually or included as part of the festival's 3-day pass. 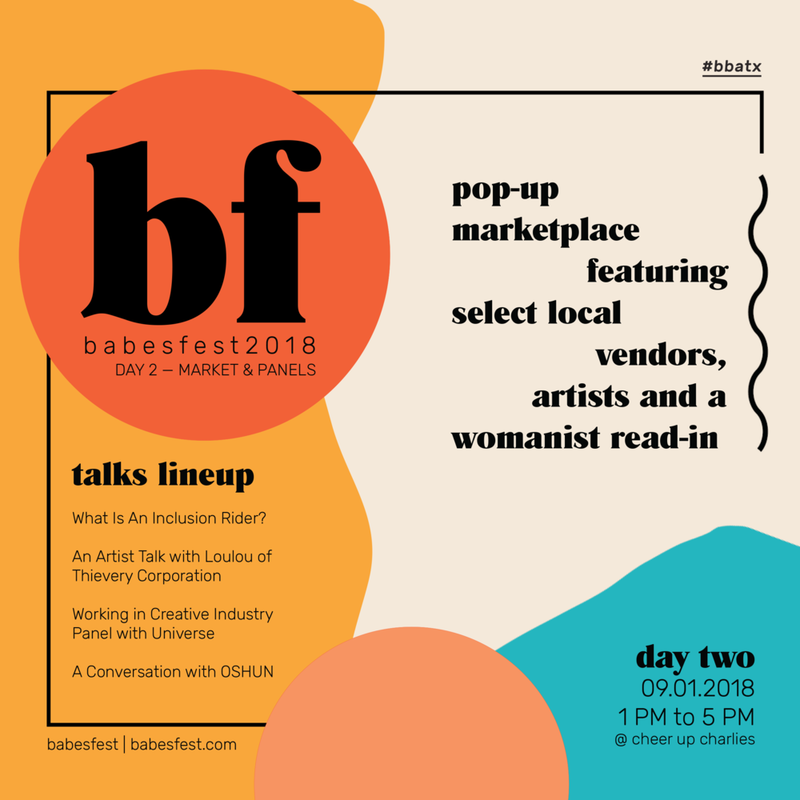 On the second day of BABES FEST 2018, my true love gave to me badass intellectual industry babes and a whole host of small businesses to support. Join us on Sept. 1 for four hours of shopping local and listening to women and nonbinary folks in the music industry chat about their work. Featuring a four-hour set by Chulita Vinyl Club and a pop-up library with The Womanist Read-In Project, tickets are only $10 or included with the BABES FEST 3-Day Pass. As the biggest night of our three-day festival, BABES FEST's music showcase features 8 acts and multiple surprise performances. Headlined by award-winning duo OSHUN, the evening features 10 performances from women and nonbinary musicians across the state of Texas, including RnB artist Alesia Lani and punk band Pleasure Venom. Tickets are only $25 and can be purchased individually or included as part of the festival's $50 3-day pass. #BABESWHOEAT. On September 2, BABES FEST closes with a decadent brunch by La Pera and panel discussion featuring conversation between Cheer Up Charlies owners Tamara Hoover and Maggie Lea and BABES FEST co-curators Jane Hervey and Leslie Lozano. Featuring a set by DJ Mira Mira, tickets are only $20 or included with the BABES FEST 3-Day Pass (your meal is obvi included! ).